Bitclub Advantage Network: How i Earn Bitcoin While Sleeping With Bitclub Advantage. Bitclub advantage giving me joy like “Kilode”. with another 300% & even extra on it. Once I renew my account, another 300% is already loading. Abeg, Bitclub advantage sweet no be small. Those are the words of Testimony of Bolanle Chris-ezomoh a member of the bitclub advantage Network. 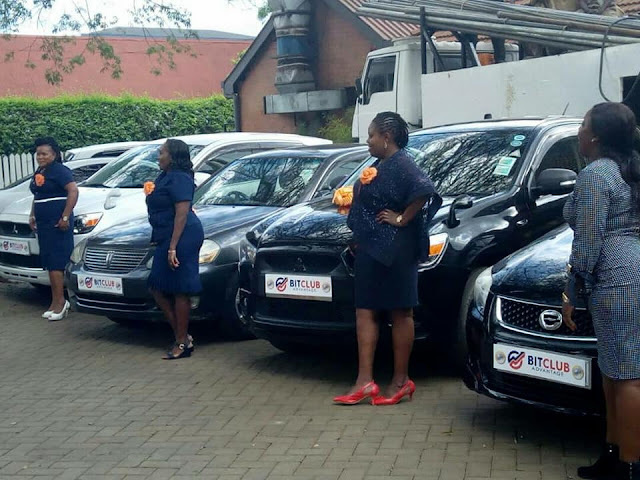 BitClub Advantage has done it again, Car achievers and the Millionaires Circle. Turning Ordinary people into Extra ordinary Millionairess. Congratulations are in order to my uplines. I believe the only thing between us and our DREAMS is taking ACTION. Be a part of this life changing wave. Those are the words of Marcel Kw a member of the bitclub advantage Network. BitClub Advantage is a company formed by a team of PROFESSIONAL TRADERS with EXPERTISE in one of the biggest financial markets of today, the CRYPTOCURRENCY. Our focus is to provide our affiliates with daily and constant profits in these markets. The Bitclub Advantage CEO is Alex Vera and the company has it’s head Office in the UK. Bitclub Advantage have commission Offices in Hong Kong, Germany, Spain, France, Kenya, Uganda, South Africa, Nigeria etc. There are 2 ways to participate in the bitclub advantage network; Active participant and Pasive Participant. Bitclub Advantage Active Participants; These are people that invest in the bitclub advantage network , Promote the network and refer others to the network. So they earn from their investment and also from referrals. 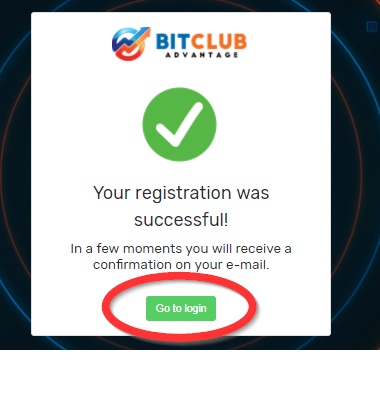 Bitclub Advantage Passive Participants; These are people that doesn’t want to promote or refer anybody to the program, so they earn only from their investment. or digital currencies, selling at a higher price than the one you purchased. It is, therefore, a short-term investment. Bitclub Advantage has 7 Different invest Plans and the returns are fixed by on the different packages you choose. You can earn 1.12 – 1.4% daily, Monday – Friday Only makes a week in Bitclub Advantage. See below how the Bitclub investment plan works. 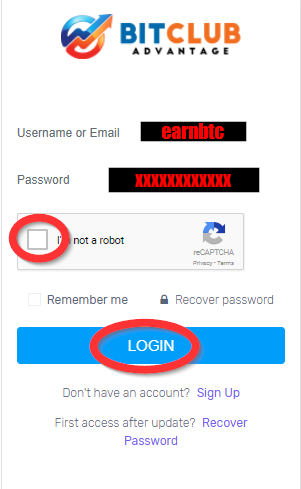 Those are the basic earning from investment only but for those that can promote the Bitclub Advantage program, they can earn referral commission. 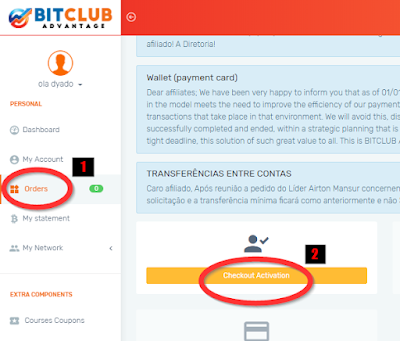 See Bitclub Advantage Compensation plan for Affiliates below. There are 5 ways Bitclub advantage Affiliates can earn Commission and Bonuses. This is the bonus or commission you earn for every person you directly refer to the bitclub advantage program. It’s 50% (half) of the 15% of the investment plan your direct referral is activating. This is how it’s calculated. $264 – $15 = $249. So the 15% can only be charged on $249. 15% of $249 = $37.35. So direct referral bonus will then be 50% of $37.35. $37.35 x 0.5 = $18.675. Since you know understand how it’s calculated see the detail direct referral bonus for All the packages below. The remaining half of the 15% of the package cost is paid as indirect bonus level 2-8. From level 2- 8 the remain half of the 15% is spread as follow. 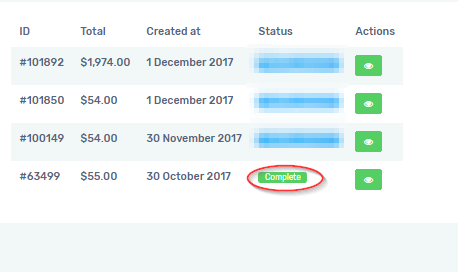 So if we still use the Client Silver example, the total 15% commission is $37.35 and you already earned $18.675 as direct commission. which sum up to $18.675. Binary simply means two, which means you need to introduce minimum of two people before you can entitle to binary matching bonus. The company pays 50% of all volume (Points) produced by your weaker team daily @ 11:59pm and each points equal $1. How is Bitclub Advantage Point Values Calculated? Points are accumulated through referral and each referral is assigned a point as shown below. This is based on points accumulated by referring new members to the bitclub advantage program. All bitclub Advantage package expires when you earn 300% of any of the package you buy and to continue to earn, you have to buy another package again. 2. Fill the Form with your info, tick i agree to all terms and click on signup. 5. Once you Login, you will be required to update your info. So click on data tab and update your WhatsApp number then on the Address tab and update your address. verification can be done later. 6. Login to your email, you will see a welcome email from Bitclub Advantage, click on confirm your account. 8. 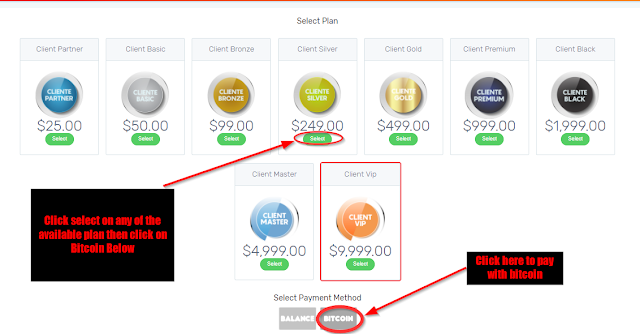 On the next page select a plan, click bitcoin to pay then Click Done to proceed to the payment page. 9. 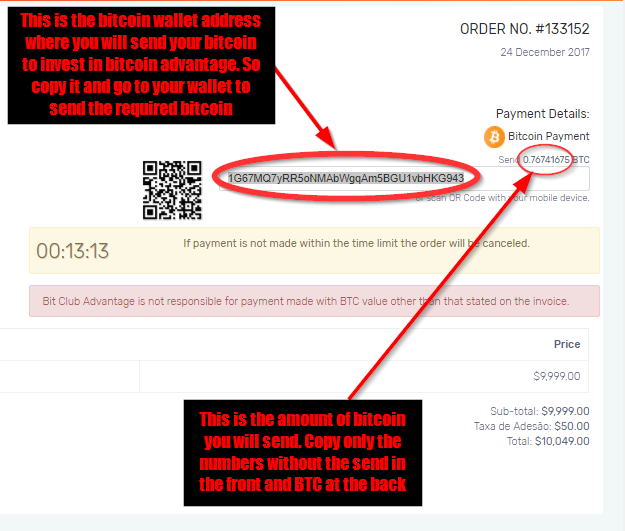 On the next page, Copy the bitcoin deposit wallet address generated for you and the amount of bitcoin you are to send and head over to your wallet to send the bitcoin.